Brandeis faculty and staff are valuable partners in helping students discover who they are, what they want and how to get there. Share your opinions on undergraduate career development and services! The Hiatt Career Center is running one-hour focus groups with faculty. One in five participants will receive a $100 Amazon gift card. These groups are part of continuing efforts to engage and learn from faculty with the goal of improving the student career development experience at Brandeis. Refreshments will be provided during each session. Click here to enroll. Hiatt welcomes the chance to meet with your program or department during a staff meeting or another time to share mutually beneficial information, referrals, programs and services. 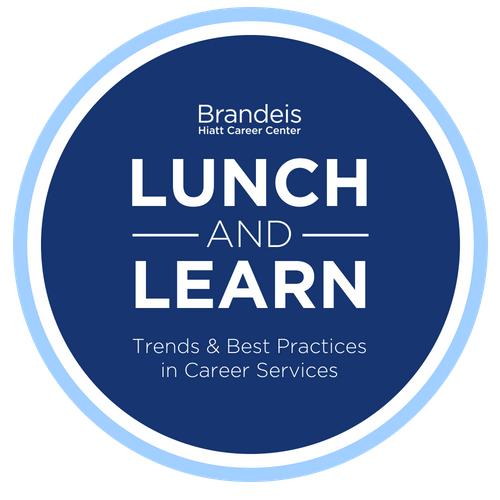 For example, your department or program may want more detailed information about online career resources such as Handshake, LinkedIn, the Brandeis Internship Exchange, or Hiatt’s Beyond Brandeis tool. Learn more about Hiatt's philosophy and approach informed by scholarship, research and practice in the field of career development. Contact Jon Schlesinger to schedule a meeting or group demo in our conference room or yours. The career counselors in the Hiatt Career Center assist students throughout the career development process; from connecting their coursework to potential careers, to preparing for networking opportunities to searching for jobs and internships. Encourage your students to schedule an appointment with a Hiatt counselor or to stop by for a 15-minute drop-in appointment in-person or online via HiattChat. You can also refer students to Hiatt from your department or program website. Contact Kristin Menconi for content for your website. 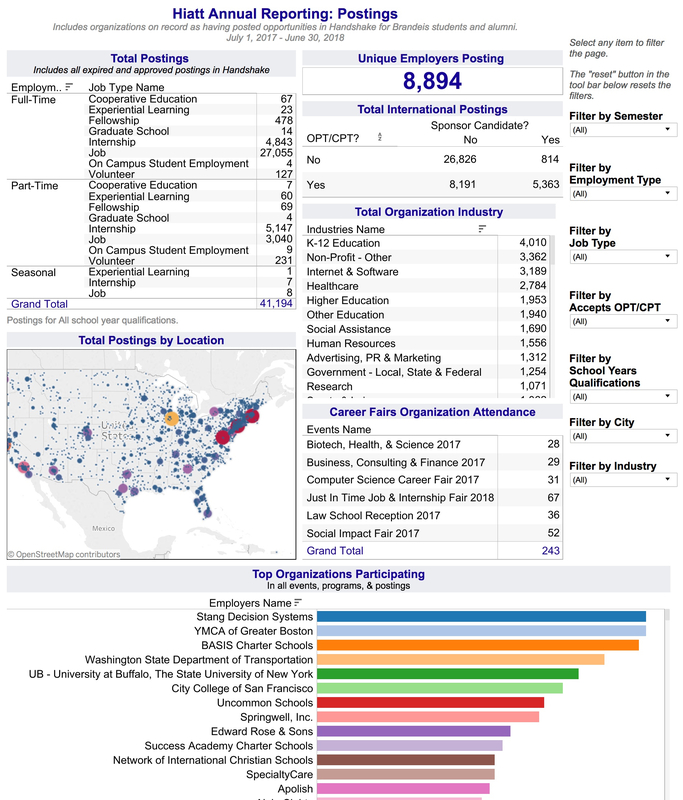 Handshake, the online recruiting database shared by Hiatt, Heller, GSAS and Brandeis IBS houses career events, resources and thousands of job and internship postings for both undergraduate and graduate students. Our employer relations team expands employment opportunities for Brandeis students by building relationships with alumni, employers and other key members of the Brandeis community. If you receive postings that are relevant for Brandeis students or alumni, forward them to recruiting@brandeis.edu so we can get them posted in Handshake. If you receive postings from Brandeis alumni, encourage them to fill out our online job posting form. You can also share relevant opportunities with your students by adding a tailored job/internship feed to your department or program website. Contact Jon Schlesinger to request one for your website. Explore organizations that have posted opportunities in Handshake. Occasionally, helping students in their job searches can result in unanticipated illegal or unethical actions. The National Association of Colleges and Employers (NACE) provides a set of ethical standards for guiding the job-search process. Hiatt sponsors a number of career events for students throughout the year, including industry networking nights, career fairs, skill-building workshops, alumni panels and more. We encourage you to attend, co-sponsor, and help promote relevant events to your students. View the full event calendar. If your students have a specific need or interest that is not already covered, we offer custom events and workshops. We also partner with student leaders like UDRs and club presidents on career programs and coach them through the process. As a team, Hiatt continues to cultivate strong relationships with alumni, employers and parents in various industries who are willing to speak with specific majors and student groups about their career paths, companies or other career-related topics. Contact Hiatt to identify potential guest speakers from our volunteer list. To help students connect their majors and campus involvement to potential careers, Hiatt offers a number of resources. Brandeis graduates are sent a survey within six months of graduation to identify their first destinations, including graduate school, full-time employment and more. When students communicate with you about their postgraduate plans, have them complete the survey. The post-graduation data that has been collected from class years since 2008 is placed into an interactive tool called Beyond Brandeis. Browse by major, class year, industry and more to see where recent Brandeis graduates are employed and/or attending graduate school and encourage your students to do the same. BIX is a searchable database of internship reviews written by Brandeis students. Log in your UNet ID and password to search reviews by major, field, class year and more, to see where your students intern, and understand the substance and quality of their experiences. To keep BIX up-to-date and relevant, advise your students to submit an internship review at the end of each semester. If you teach an academic internship course, consider making internship reviews a course requirement. The professional networking site LinkedIn is a wonderful resource for finding students and alumni, as well as building your own online brand. We encourage you to join our Brandeis University Career Connections group on LinkedIn to connect and reconnect with current and former students in a moderated environment. A note to Brandeis students: In an effort to keep a manageable LinkedIn network, I only accept invitations from colleagues with whom I have business relationships and from student staff who work in the Hiatt Career Center. Please join me in one of the numerous groups affiliated with Brandeis University, including Brandeis University Career Connections and the Brandeis University Alumni Networking Group. Check with your administrator to see if your academic program or campus department has a policy about accepting social media requests from students and alumni. Students and alumni may ask you to be a reference or to write a recommendation on their behalf. The National Association of Colleges and Employers (NACE) provides guidelines for reference providers. View a sample faculty reference letter. Consider using the online credential service Interfolio to store letters of recommendation.